So you’ve decided to hold a garage sale! What a great way to get rid of all the clutter you’ve accumulated over the years. There’s a lot more to a garage sale than meets the eye, what with the planning and the pricing and waiting for people to come. We just had a garage sale over the weekend and did fairly well, although the weather didn’t like us very much! 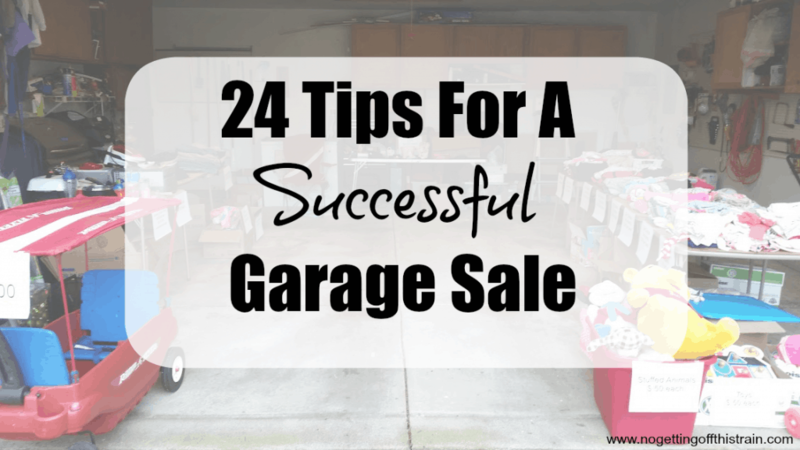 I definitely learned a lot, and so I’ve come up with 24 tips for a successful garage sale that will hopefully help during the upcoming season! 1.) Make sure you have enough boxes and tables. When we were packing up Allison’s clothes, we realized we severely underestimated how many boxes we needed. And then we kept adding more and more items from the house. Ask friends and family to bring home boxes from work, if possible. We also didn’t have enough tables for the sale, so we had to borrow more from my parents. Always overestimate what you need! 2.) Don’t give in to re-sellers. I’m sorry to all you re-sellers out there; I know it’s a good way to make money. If you don’t want to sell something for a super-low price, it’s okay to say no! On the first day of our sale, I had all of my video games in a large box. I sold quite a few in the first few hours, and then a guy came in, opening each box and examining each disc. He then asked how much I was asking for the whole box. It wasn’t until I accepted a too-low price that he told me he bought and re-sold items. Ugh. I have a hard time saying no, so I’ll be practicing what I preach! 4.) Keep your children entertained. In any way possible. I felt bad keeping Allison outside all day, but she had snacks, she watched Daniel Tiger on her tablet, and she was able to run around the front yard when it wasn’t raining. 5.) Put big and popular items up front. We had an office desk, a wagon, and a crib/changing table set that we set outside the garage. Putting the big items right out front like that attracts those passing by and makes them more likely to stop to see what else you have. 6.) Get lots of change. Make sure you have plenty of 1’s, 5’s, and quarters. That’s mostly what you’ll be handing out as change, and be prepared to go back to the bank the next day to get more. I’ve found that most people try to give you the smallest bill possible, but we got a lot of 20’s and had to go back to the bank for more change. We started with $50- $10 in quarters, $20 in 5’s, and $20 in 1’s. 7.) Keep track of what you make. I loved tallying up how much we made each day! I kept a clipboard with paper and a pen, and just wrote down the dollar amount sold for each transaction. And I kept track of each day, so I know that Thursday was our best day. 8.) Keep pen and paper handy to keep track of large orders. We had hundreds of baby outfits on the table, and I had a couple people that would pull out a few, give them to me to hold onto, and go back for more. To help keep track, I just wrote down how many they gave me as they went along, and that really helped when I went to calculate the total. 9.) Have a backup plan for weather. There’s no way to tell whether you’ve just scheduled your garage sale for a cold, rainy weekend, so make sure you have a backup plan. Move everything into the garage, or set up a canopy outside to keep the rain off. 10.) Price everything 2-3 days beforehand. Don’t wait until the day of, when you suddenly realize you’re in over your head with all the stuff you’re selling! You don’t have to price everything individually; put all books in a box and label the box with one price, or bundle some clothes together and put one price tag on it. 11.) Map out everything beforehand. If you have a good idea of how much stuff you have, try to draw out where you think everything will go. For example, put all kitchen items on one table, CDs and movies on one table, etc. This way, you’ll better know if you have enough tables for your items. 12.) Check Ebay for prices. Before I put out my CDs and video games, I did a quick search on Ebay to see if I had anything worth selling online. Most of them were only $5-10, but I found one video game that was selling for over $100! There was no way I could sell that for that much at a garage sale, so I set it aside for later. Make sure you’re not underselling potentially valuable items! 13.) Join garage sale groups on Facebook. All I did was type “garage sale” into Facebook’s search bar and immediately found a couple groups for my city. Make sure you read the rules for each group to see what you can post and how often. 14.) Advertise a few days beforehand. Both on Facebook and Craigslist! I didn’t think Craigslist was good for garage sales until a few people actually told us during our sale that they found us on Craigslist. To get even more people to come in, advertise some of your big-ticket items. We advertised Allison’s old crib which pretty much sold immediately and got a few emails about. 15.) Save paper and plastic bags. We like to reuse our plastic bags as liners for our small trash cans in the bedrooms/bathrooms, so we always have at least a few. In the few weeks prior to your sale, gather as many as you can. I’m not saying to steal a large chunk from the store, but you could probably use a couple more bags than what you need while checking out. 16.) Keep smaller expensive items in back. Video games, CDs, movies, jewelry… anything that’s worth a bit more money, make sure to keep them on one of the back tables close to where you’re sitting. We’ve never had anything stolen from us, but it’s been known to happen! 17.) Don’t do it alone, especially with children. I couldn’t imagine doing this sale without John. Trips to the potty, getting Allison down for a nap…. it’s almost impossible to run in the house real quick for something when you have a toddler. Thankfully, my parents were around to help for a small part of it! 18.) Have a multi-family garage sale. 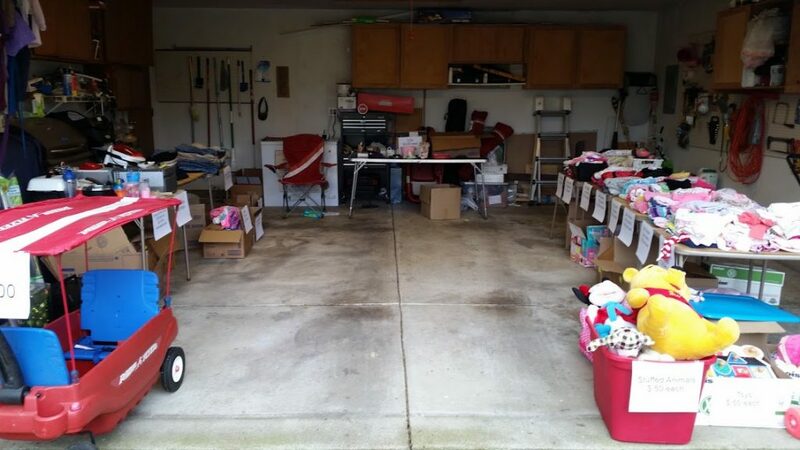 If you don’t think you have enough stuff to sell, get your family together and have a massive garage sale. Bigger sales tend to do better and attract more people. To keep things in order and separated, try putting different-colored price tags on everyone’s items so you know who will get paid for what. 19.) Check for permit requirements. My city requires a permit to hold a garage sale, but it’s free to do so, so all I had to do was stop by City Hall to get a permit. I just had to stick it in the window or somewhere visible during my sale. 20.) Check for community sale dates. My city has two community-wide garage sales every year, where anyone can have a garage sale that weekend without a permit. Unfortunately, our most recent sale got rained out, so we’re holding onto the leftover items to try again in June for the first community sale. It’ll be better weather, and more people will be out searching for the sales. 21.) Neatly organize and label everything. If nothing’s in order, it’s going to be a lot harder for people to see what you have and may just give up. Arrange clothes in piles according to size, along with a sign stating the size and price. Label any boxes with the contents and prices as well. 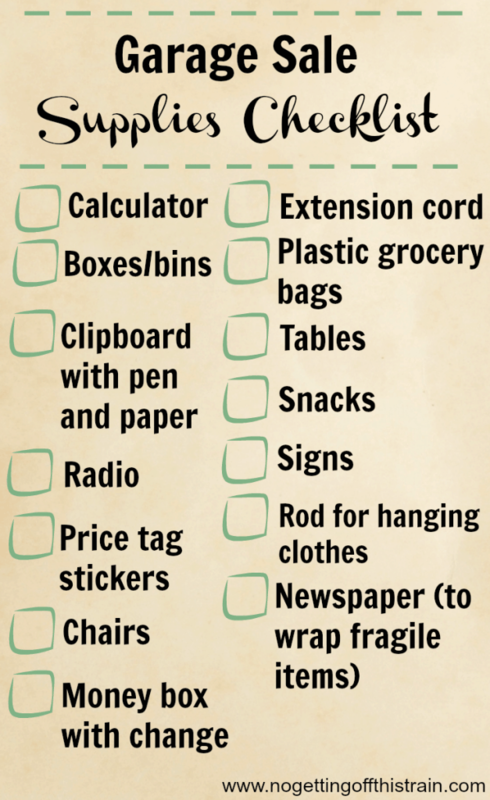 For everything else, use price tag stickers, which can be found at the dollar store. 22.) Time your sale according to your area’s best dates. For example, my city’s best day for garage sales is Thursday. So instead of having the sale Friday through Sunday, we held ours Thursday through Saturday. And we were right in doing so; over half of our sales were on Thursday! 23.) Include photos in advertising. If you advertise online, make sure you add clear pictures, especially for the big-ticket items you’re advertising. We got a few emails from people wanting us to take more photos of certain items and wanting to know what else we had in the pictures. It’s a garage sale, so items need to be cheap. It has to be a balance between pricing so high that no one will buy, or pricing so low that you cheat yourself out of money. 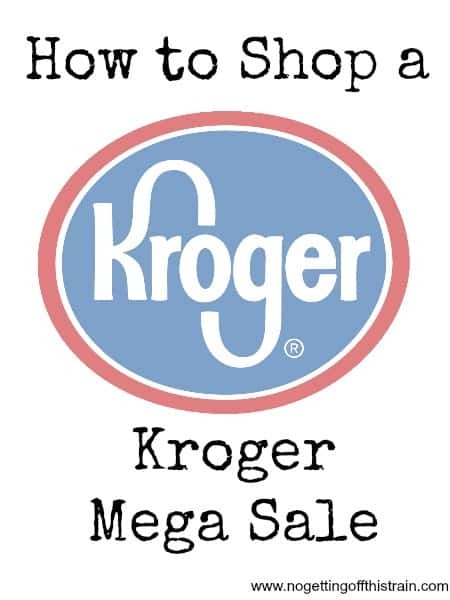 I used this handy list to give me an idea of how to price my items! 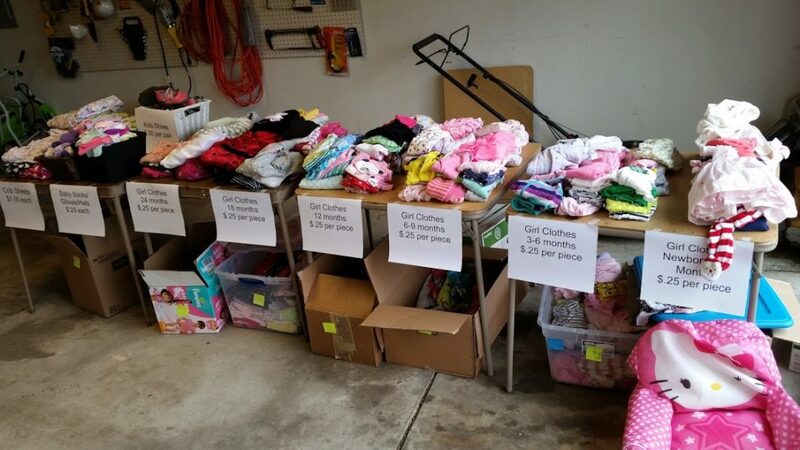 We had hundreds of baby clothes, so we priced it all at a quarter a piece. Someone complimented us on it and said she’d been to sales where people were charging like $1.50 a piece! I’m not sure we would have sold as much as we did if we’d priced our baby clothes that high. 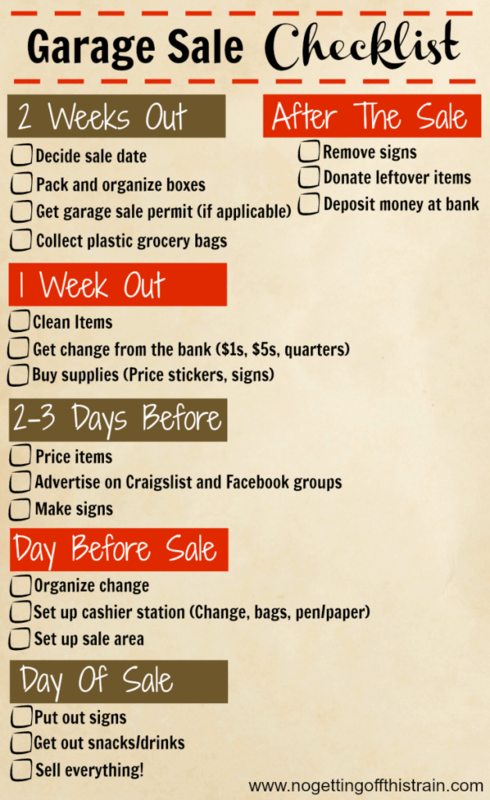 In addition to the tips above, I’ve created both a timeline checklist and supplies checklist for your next garage sale! Hover over each image to Pin it, or download the PDFs underneath them! What other tips would you add to this list? What Goes On Sale in November? 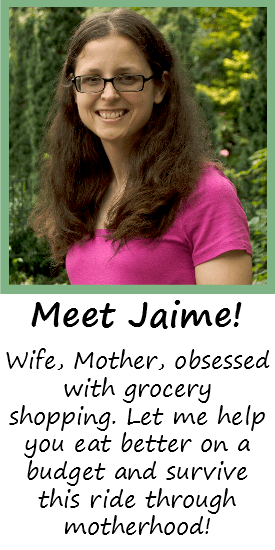 Not only is this an excellent post, but I love your printable lists too! I want to do some yard sales this summer if I can get the time. I’ll for sure be keeping this in mind! I love getting rid of things and making money. We try to do at least one garage sale a year and I make around $300 and seem to keep finding more things to get rid of each year. I try to sell some of the items on the facebook groups first because you can get better prices there first. It gives me a deadline to try to get rid of things before the sale. I think that another good tip is to make anything into a table like saw horses and a door which we used. I also do two layers so there are tables and in front of them are laundry baskets upside down or boxes with table clothes. Great printables and hope that I can use them to stay organized next year!! !